Welcome to our Memorial Day weekend round up! I've been looking forward to sharing some of the edible highlights of what was a lovely family gathering. Our barbecue, by my husband's special request (it was his birthday so he was running the show! ), was anchored by a main course of Sausage and Peppers (my mom makes this dish and it's absolutely delicious). With the meat spoken for, I decided to take the opportunity to indulge my ever-growing vegetable obsession. I knew exactly where I would look for inspiration - to one of my favorite Italian chefs, in this case, Mario Batali. I am always inspired by the way Italians treat vegetables. They just seem to have a knack for making them shine without overpowering their natural merits in any way. Batali's cookbook, Italian Grill, is a perennial favorite in our house. We cook from it summer after summer, but I had yet to try his recipe for mixed vegetables on the grill enhanced with a bright, citrusy marinade. 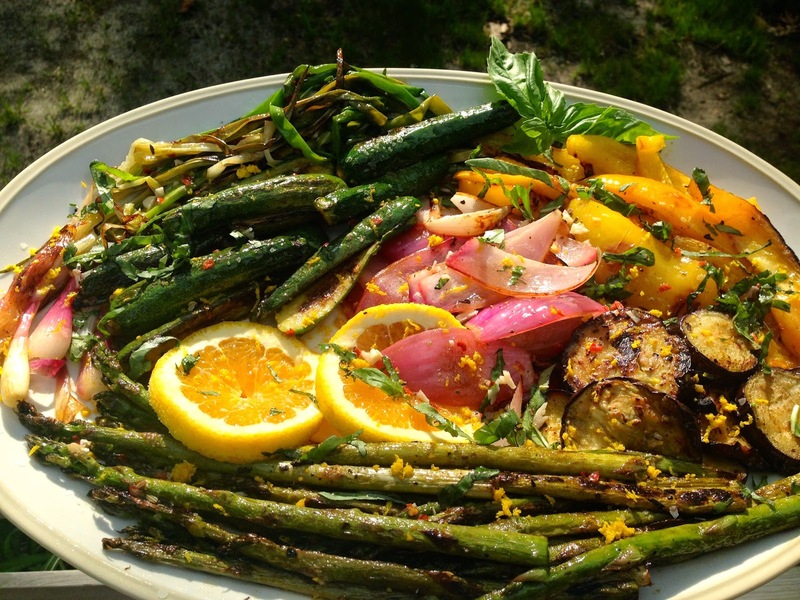 I hope you enjoy this colorfully eye-catching grilled platter of meatless delights. It makes a stunning presentation and an even better impression once you taste it. As Mario reminds us, choose vegetables that are in season, and feel free to mix and match based on what looks best to you! Zest of one Orange, reserved. 1. Place a large baking sheet on an outdoor grill and get it nice and hot (or indoors, use a grill pan or preferably a large smooth skillet atop two oven burners). 3. Brush Vegetables on both sides with the Vinaigrette and lay them on the baking sheets. You may need to grill in batches. Sprinkle the vegetables with Salt. Cook, turning once or twice, until just slightly charred. 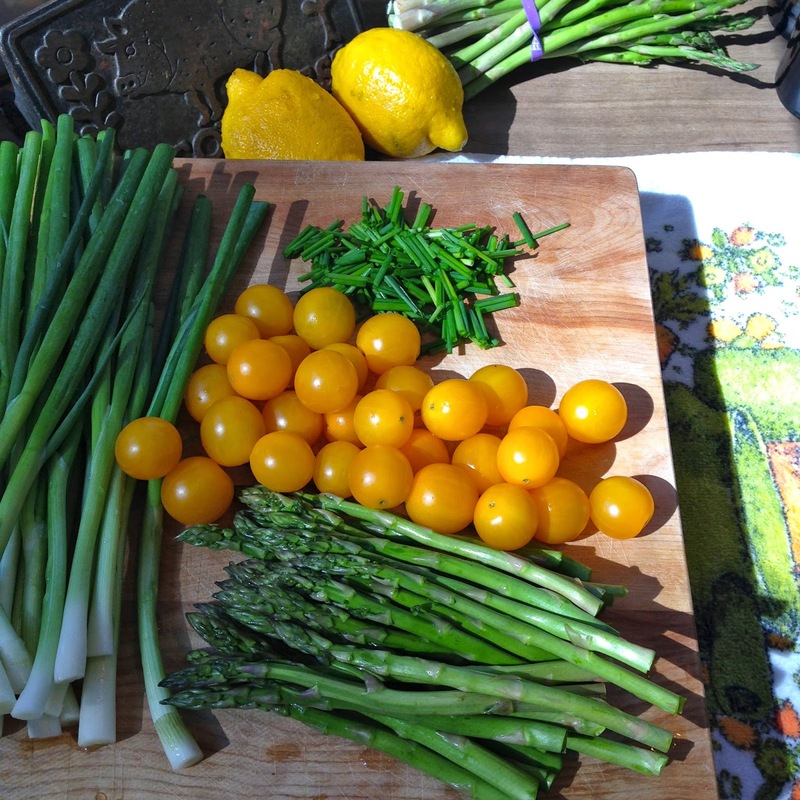 Keep an eye on the smaller veggies especially, as they may char quicker. Remove veggies as they are tender enough and cooked through. Asparagus should grill for 5-7 minutes. Be sure to remove each vegetable as it is done. To serve, arrange artfully on a large platter and sprinkle with extra Vinaigrette. Garnish with optional slices of Orange and sprinkle everywhere with Orange Zest. To finish, add your Basil ribbons and serve!! This is great warm or room temperature. Need a starter nibble? 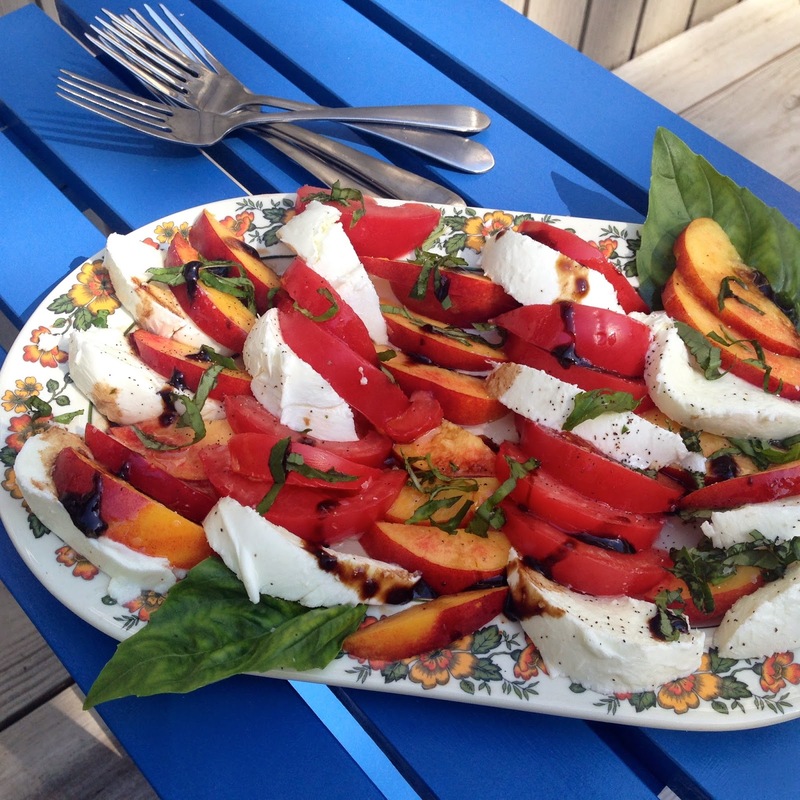 Why not try my default plate of delectable Buffalo Mozzarella (or even Burrata--swoon!) with in season stone fruit (in this case, Nectarine) plus ribbons of Basil, and a drizzle of Olive Oil and Balsamic Reduction. To finish, just add a sprinkle of salt and pepper and you're good to go! Now don't get me wrong, we do want to leave plenty of room for the meat on our barbie. Check out my mom's Sausage and Pepper masterpiece that we served along with my veggie platter. It was so good! Finally, a barbecue just ain't a barbeque without a refreshing cocktail to wash everything down. That's why we are declaring Paloma time! Learn a bit more about about the Paloma HERE. Now you may have noticed I am on a bit of a Grapefruit jag, so Palomas made with gorgeous, fresh-squeezed ruby red grapefruit seemed like a great idea. We serve ours Margarita-style with a salt rim. I am even gonna go out on a a limb and call it our official drink of summer 2014. Here's the how-to below (to make it virgin, replace Tequila with Seltzer water in equal parts). Rim each glass with a Lime Wedge to moisten. Pour Kosher Salt into a flat plate and invert the glass over it to create a salt rim. 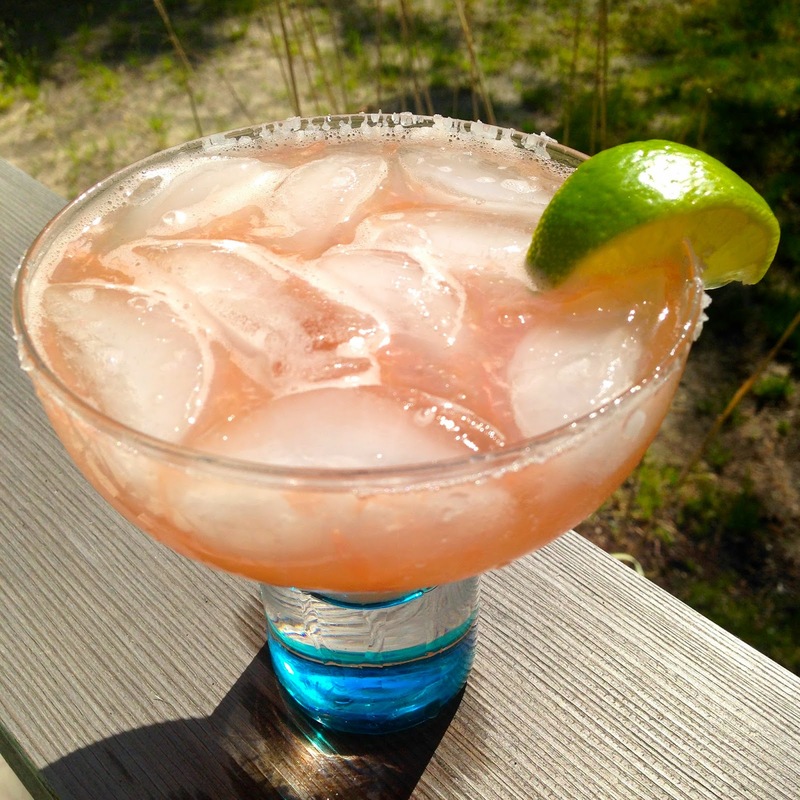 In a shaker, place a few cubes of ice, Tequila, Grapefruit Juice, Lime Juice and Simple Syrup. Give it a good shake and pour it into Margarita Glass. Garnish with Lime Wedge and serve. There you have it, folks. A successful holiday barbecue for the books. We hope it'll help gain some inspiration for your next summer feast! Around this time each year, I get to thinking about new ways to zhush up an old favorite in our house - Couscous. Couscous is our standby summer side because it's a wonderful make-ahead dish that tastes great at room temperature and lends itself to all kinds of creativity. I love that it feeds a crowd, and with the right accoutrements, I find it far and away more exciting than your everyday traditional pasta salad. With all those barbecues and summer parties around the corner (we'll tell you about our Memorial Day celebration very soon), you can never have too many ideas for potluck dishes. As far as types of couscous go, we strongly prefer Pearl Couscous, also known as Israeli. This larger variety holds up really well and just feels a bit more stick-to-your-ribs than its smaller-grained cousin (I should mention that "regular" cous cous is actually more a grain - semolina to be exact - than a pasta, per se). 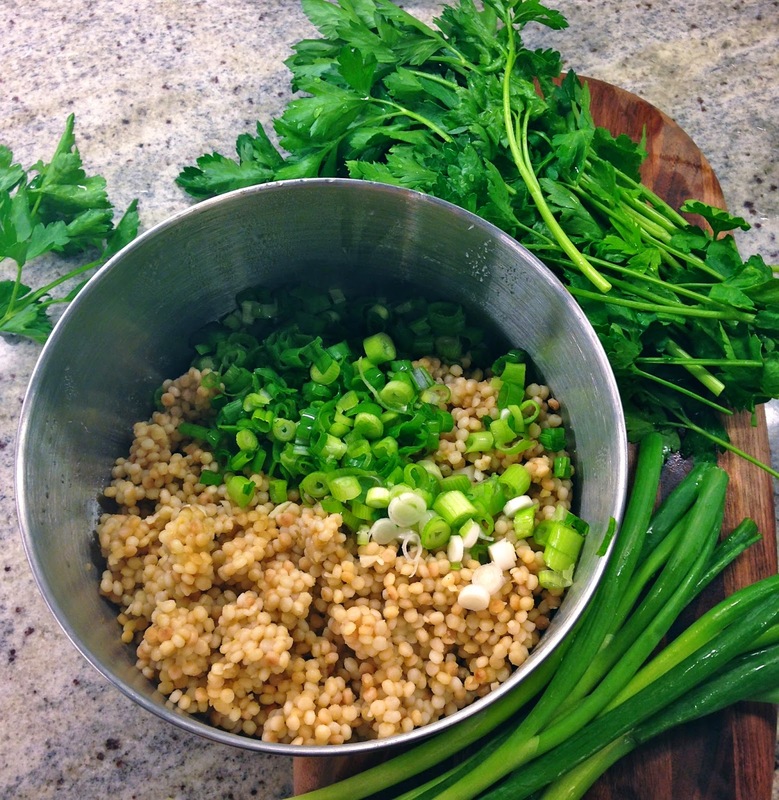 For more ideas and info, check out last year's special Couscous recipe HERE. I hope you'll also stick around for today's latest colorful twist on this scrumptious side. I used dried cherries and lots of scallions to create a tart and savory dish that ended up being quite satisfying (with tons leftover for later in the week). It also made a welcome accompaniment to my the tasty roast beef dinner my husband cooked up for me. minutes but watch it closely to avoid burning. Pour the toasted Couscous into a bowl and set aside. Toasting brings out more flavor and makes the small, round pearls even more visually appealing. 2. In the same large saucepan, bring Broth to a boil and add the Couscous. Turn flame down to a simmer, cover the pot, and cook about 6-8 minutes, stirring occasionally, until Couscous is cooked through and the liquids have disappeared. Ideally it should still have some bite to it, and be somewhat al dente. 3. Now add minced Garlic and remove from the heat. Place in the refrigerator to chill. This can be done a day in advance. 4. When ready to finish, stir in the Scallions, Dried Cherries, three squeezes of Lemon Juice and the remaining Tablespoon of Olive Oil. Give it a good stir. Add the Salt a quarter teaspoon at a time so you can adjust it to your taste. Finish with ample Black Pepper. Stir again and store in the fridge until ready to serve. This will keep well overnight and for several days after. The flavors should have time to blend before serving as the definitely get better and better with time. 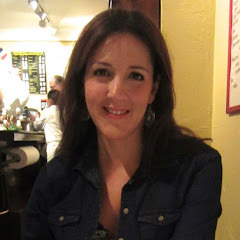 Today's spring pasta dish came to be thanks to an impromptu date night my husband and I had last week - a lovely evening dining at a charming, rustic Italian restaurant called Peasant in NYC's Nolita. While I savored an exceptional plate of cavatelli with broccoli rabe and sweet sausage, the mister was enjoying some very fluffy potato gnocchi with seasonal greens, fresh, plump spring peas, herbs, and a touch of rich brown butter. Our date continued with a long stroll through the West Village past some old haunts and even the church where we were married nearly four years ago. Whether it was the warm breeze or the waning glow of late spring sunlight barely hanging on at dusk, the evening, at least for me, was kinda magical. Pleasant thoughts of how so much can change in a short time frame flooded my mind, along with nervous apprehension for the new and exciting chapters that lay ahead. But most of all, I found myself silently giving thanks for the person I was walking beside, the special guy reliving all these great memories with me, block by block. One bag of gnocchi later, and I was ready to create something springy and delicious as an homage to that memorable night, and of course to feed my favorite diner, who by this time was looking a bit forlorn with hunger. Lucky thing that this meal would be ready in about 15 minutes! I had decided to play off the deliciously simple Italian comfort classic that my mom used make me all the time - Pasta Piselli, or pasta with peas (and sometimes ham or pancetta), one of many happy food memories made possible by my mother. I hope you enjoy my Gnocchi Piselli with Herbs and Brown Butter. It's sort of a rustic, hand-minced, deconstructed pesto that includes bright green peas and a little brown butter rather than oil. My husband helped me come up with what I think is the pretty clever move of flash-warming the frozen peas as you drain the pasta water through a colander (resulting in even more time savings). To finish, I added a smattering of pignoli nuts plus some grated Parmigiana cheese. And there you have it - Delicioso! if I do say so myself. 1. Bring a pot of salted water to a boil for the Gnocchi. 2. As the water boils set 2 Tablespoons of Salted Butter into a medium sauté pan over medium flame. Allow butter to melt undisturbed until it becomes golden and brown solids begin to form. Swirl it carefully and turn off the flame. 3. Combine Mint and Parsley on a cutting board and chop them into the finest mince you can muster. Practice those knife skills! 4. When water comes to a boil add the Gnocchi and allow to boil until the Gnocchi float to the top of the water. Time the cooking, and two minutes before the Gnocchi should be done, add the Frozen Peas! They will unfreeze and tenderize in the pasta water. 5. Set aside a little bit of pasta water in a cup, then gently pour finished Gnocchi and Peas through a colander in your sink. 6. Next, put a very low flame under the pan with the brown butter. Carefully pour the Gnocchi and Pea mixture over the brown butter. Sprinkle all over with the minced Parsley and Mint, and toss the pasta gently until evenly coated with butter and herbs. 7. Add a few shakes of Salt and some Black Pepper. 8. Plate the Gnocchi and top with optional add ins such as: a sprinkle of toasted Pignoli Nuts (or Pistachios would be great too) and grated Parmigiana Reggiano. Garnish with Mint Sprigs and enjoy! Mother's Day was sunny and beautiful as ever this year, and my husband and I were blessed to be able to spend it with our two very special moms at a fun barbecue with the rest of the fam. For one reason or another, my brain's been a bit fried lately, and as a result, I had been having trouble thinking up a plan for my usual responsibility, the hors d'oeuvres. Sure, I could have consulted this blog I know for lots of tried and true nibbles (after all, bite-sized appetizers really are my favorite), but I was just in the mood to try something brand new, ideally using the best produce of the season. 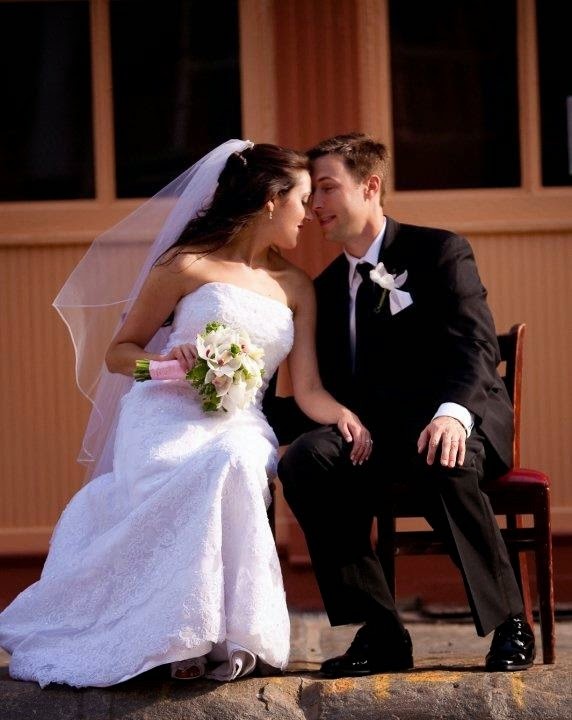 Only a day away from the big event, the answer came, and not a moment too soon! A basic hors d'oeuvre served at my good friend's baby shower would provide the inspiration for today's strawberry cream cheese sweet and savory toasts. Date nut bread slathered with whipped cream cheese and then topped with a sliced ripe strawberry ended up being the most amazing and easy to make treat - sweet yet not too sweet. After undertaking some further research around cream cheese and date nut bread, I learned that this combination is also reasonably famous in retro food history. My variation using semolina bread will take on more of a sweet/salty quality, but I recommend both versions for your next party. They could not be simpler and with strawberries in season now, they're a wonderful way to showcase everyone's favorite berry. Hors d'oeuvres aside, a complimentary beverage that our moms would love also seemed in order. For this, I turned to the peak season fruit I've been eating non-stop lately - the Grapefruit. Trust me, grapefruit is particularly fantastic right now. You should go out and get some next chance you get. I am happy to say that what I came up with was a drink that's pretty in pink and refreshing and summery as they come. I even decided against adding alcohol this time (I know, "who are you and what have you done with Mr. & Mrs. Neurotic Kitchen?). Rest assured that I bet this would be mighty delicious with a shot of vodka or gin in it, should the mood strike. Need more nibble ideas? Also pictured above you will find Savory Rosemary Wafer Crackers (we like 34-degrees brand) spread with luxurious Mascarpone Cheese and topped with a slice of fresh Apricot or any other in season stone fruit. Finish them with a sprinkle of black pepper and serve right away! Set up 6 short tumbler glasses and add to each 2 Tablespoons Grapefruit Syrup. Next, fill each glass 2/3 of the way with Seltzer Water and add 3-4 Ice Cubes. Stir. Pour two big slashes of fresh squeezed pink grapefruit juice or bottled pink grapefruit cocktail. 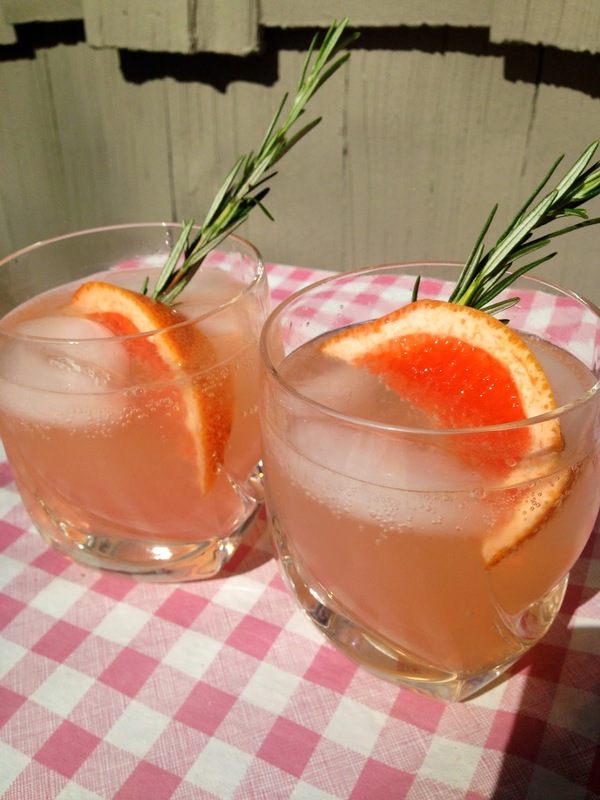 Garnish with Rosemary Sprigs and enjoy! 1 Round Loaf of Seeded Semolina or other crusty bread, cut into thin slices then cut into thirds. 1. Sprinkle sliced Bread with Olive Oil (I like to apply my oil by pouring some into a small bowl and dabbing some scrunched up paper towel in it before stamping it onto the surface of the bread - the method works really well~) and toast until slightly golden. While toast is still warm, sprinkle with Coarse Salt. 2. In a separate bowl, lightly mix about 4 ounces of the Cream Cheese with 2 Tablespoons Agave and gently combine. If you require more Cream Cheese mixture you can repeat this process later. 3. When ready to serve, spread a follow of sweetened Cream Cheese onto each toast and top with a Strawberry half. Serve immediately and enjoy! Sluggish Monday or not, you probably know by now that in our house, we'd never let Cinco De Mayo pass unnoticed (do take a look back at our 2012 and 2013 Mexican-inspired food celebrations). We're skipping the margaritas this year (let's call it our half-hearted attempt to behave like model citizens a few weekdays), and streamlining recipe prep work more than usual because, well, after a weekend, it takes us a bit more effort to get in the swing of things. Still, we're in a celebratory mood for a few reasons, one of which being that just last week, Neurotic Kitchen took great pleasure in receiving the official seal of approval from MeatlessMonday.com. This wonderful internet destination for all things meatless noticed our frequent participation in the eponymous movement, and for that, we're grateful. Needless to say, we're even more eager to continue to support this important health initiative and will look forward to creating many more Meatless Monday dishes to share with you. So today's question was, could Cinco De Mayo be yummy minus meat? The answer - a resounding si! To achieve our meatless mission, we whipped up a fast and super light salsa fresca to go with simple (just 5 ingredients) yet delicious veggie quesadillas made with a quick black bean mash, avocado, and baby spinach. Some melty white cheddar seals this tasty, handheld package up in no time flat. We tried to keep our ingredients as wholesome and clean as possible, and you'll find this dish to be kid friendly too. We hope you enjoy! 1. Mix up the Salsa Fresca ingredients in a medium bowl. Toss well and set aside. 2. Prepare the black bean mash by pouring beans into a medium bowl and adding the hot sauce. Now lightly mash them with a large spoon. They should be somewhere in between smooth and chunky. Mix well. (NOTE- if you omit the hot sauce for any reason you must remember to season the black bean mash with some salt. The hot sauce places a significant role in imparting more flavor to the beans). 3. Heat a large skillet or grill pan over medium high heat. To assemble the Quesadillas, lay out 4 tortillas on a clean surface. Spread each tortilla with one quarter of the black bean mixture (don't spread beans all the way to the edge or they will spill out), then add 1/4 of the avocado slices to each tortilla. Now add a handful of spinach leaves to each tortilla, and finish with about 4 tablespoons of grated cheese per quesadilla. 4. Fold quesadillas carefully in half and apply some pressure with your hands. Cook them 2 by 2 on the hot skillet (or more at a time if you have room) allowing them to grill on each side for 2-3 minutes before flipping. The quesadillas should brown nicely but not burn (some grill marks will appear as well). Press them down with a spatula to help the cheese melt and seal. Remove quesadillas to a cutting board and allow to cool slightly. Slice into 3 triangles a piece using a serrated knife and plate. Serve with Salsa Fresca, sprigs of cilantro, a sprinkling of sliced jalapeños and, of course, extra hot sauce. Enjoy! Spring's been here awhile now but only just recently has the weather gotten the memo. This week marked the first time in the longest that I could venture out without a jacket, and I can't tell you how happy that makes me. 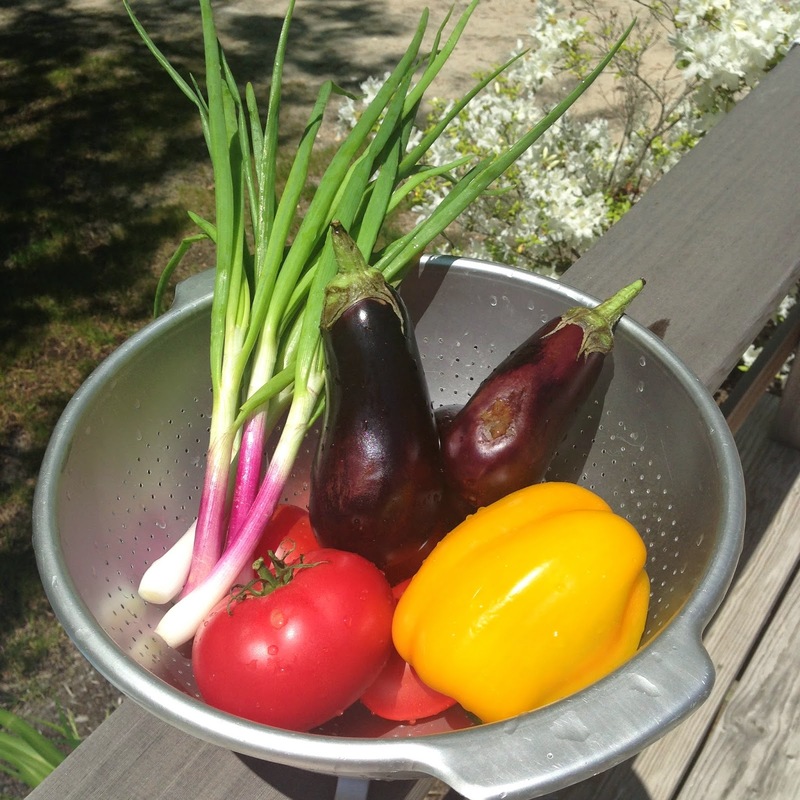 Besides that, the bounty of beautiful produce is yet another thing that makes me beam about the season. So what should we make to celebrate these warmer days? 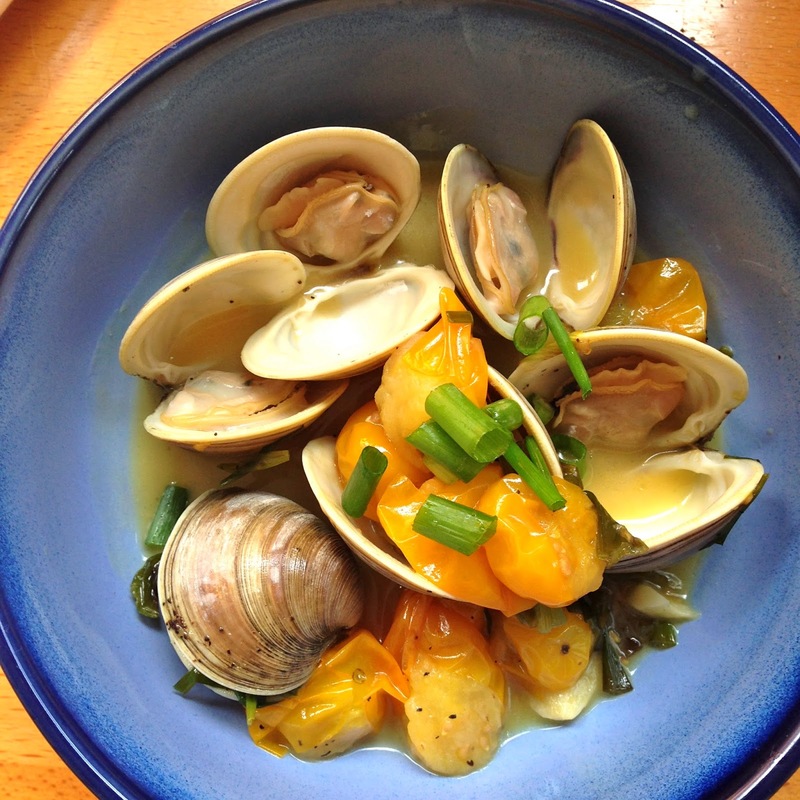 How about a delightfully easy appetizer using two of my favorite things - Clams (check my other favorite clam recipes here and here) and super sweet and delicious Sungold Tomatoes. We've paid homage to these these orangey beauties before. Because Sungolds aren't quite at peak ripeness yet (they're best in mid summer) we'll tease out their natural sugar by blistering them in a very hot pan. To add some interest to this dish, we'll toss in scallions that have been lightly charred to bring in a smokey element. Adding a splash of light beer to encourage an even tastier clam broth pulls this easy appetizer together - and as you'd expect from us, it's all done in under 20 minutes. As an entree, we opted to round things out with a simple entree of grilled Arctic Char, which was the perfect accompaniment. 1. Brush Scallions with Olive Oil and lay on a preheated grill or grill pan for a few minutes on each side until Scallions soften and char marks form. 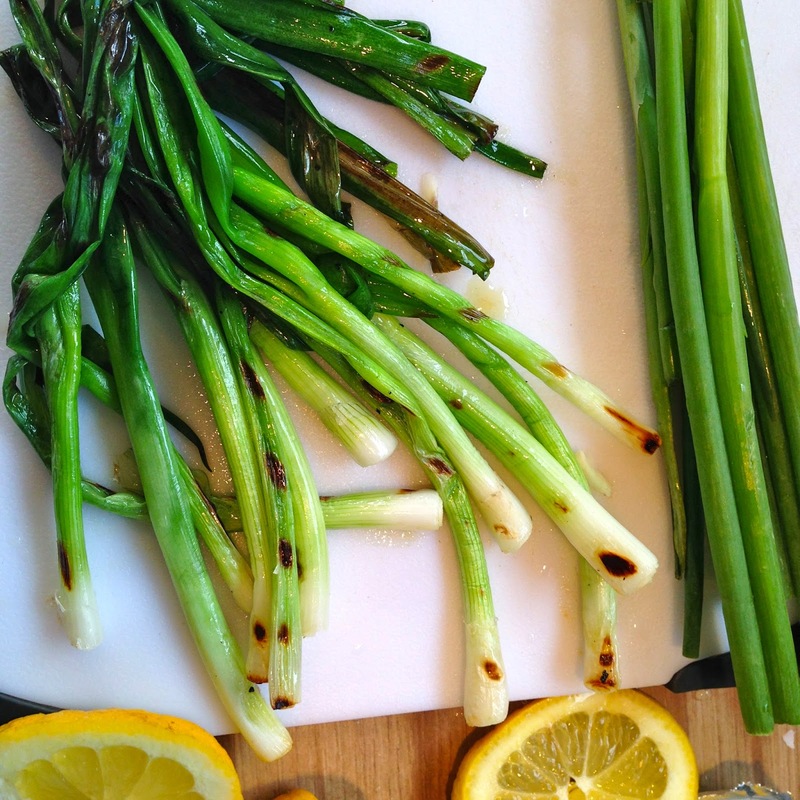 Remove Scallions to a cutting board and sprinkle with a bit of Salt and Pepper. Once they cool, slice them into 1-inch pieces. 2. In a medium skillet, warm a Tablespoon of Olive Oil over medium heat, add the Garlic, and sauté for a minute or two until Garlic takes on some color. Lower the flame to medium low and add the Sungold Tomatoes. Cook until they soften and the skins blister, about 5 minutes, tossing occasionally. Sprinkle lightly with Salt. Turn off the flame and add Scallions to the skillet. Toss. 3. Meanwhile, place beer in a deep pot and bring it to a bubble over medium heat. Add Clams and cover the pot. Allow them to steam for 4 minutes before checking on them. Watch as Clams open one by one and remove them right away with tongs to the serving dish. Give them a stir now and then. They should all open by about 8 minutes or so. Discard any that do not open. 4. To serve, plate Clams and pour broth over them. Add the Scallion and Sungold mixture on top, and sprinkle with additional Black Pepper. Garnish with a few chopped raw Chives if you like. Serve with crusty bread to soak up the broth.